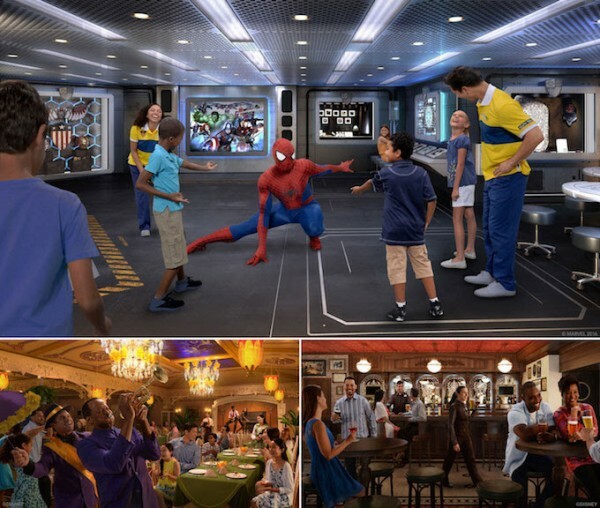 Exciting new entertainment and experiences are in store for Disney Wonder Guests after the Disney Cruise Line vessel is transformed this fall. Headlining the enhancements are imaginative spaces for children, a jazzy restaurant and an English pub. The Marvel universe comes to life in Marvel Super Hero Academy. Here, young Guests can train to develop the brave and adventurous heroes inside themselves. It’s an exciting addition to Disney’s Oceaneer Club, the engaging and interactive space just for children. After Hours, a new adult district, will feature an all-new night club, a shiny new model of the popular Cadillac Lounge, and a brand-new pub that invites Guests to take a jaunt to an authentic English tavern. After the Disney Wonder undergoes dry dock September 9th – October 23rd in Cadiz, Spain, the wave of new enhancements debut on sailings starting November 10, 2016 from Galveston, Texas. The Disney Wonder will continue to sail from Galveston to the Bahamas and Caribbean, until the ship sails to San Juan, Puerto Rico on January 20, 2017. On January 26, 2017, a three-night cruise aboard the Disney Wonder takes guests from San Juan to Port Canaveral, Florida where the ship will homeport for the spring. or click here to request a no-obligation quote online! This entry was posted on June 2, 2016 at 3:15 pm and is filed under Disney Cruise, Disney News, Disney Vacation Planning. You can follow any responses to this entry through the RSS 2.0 feed. You can leave a response or trackback from your own site.